The historic Going-to-the-Sun Road crosses the Contintental Divide in Glacier National Park and ends in the east in a junction with Highway 89. 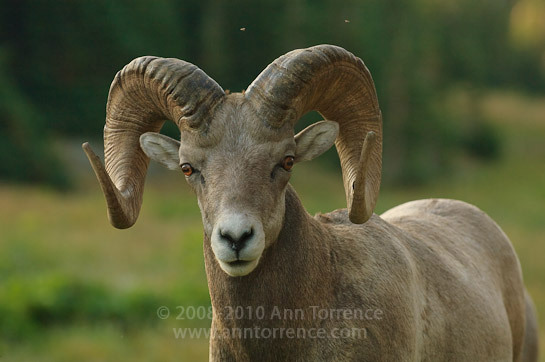 At the top of Logan Pass, bighorn sheep and Rocky Mountain Goats are plentiful. Right now the animals are contending with a mountain of snow. So are the snowplow crews trying to open the highway, especially in this 100 anniversary year of the park. Keep track of their progress on this fun web page. We went out to Bear River Migratory Bird Refuge on Sunday with a mound of optics and warm clothes. We counted 20 species, not bad for dead-of-winter car birding, with almost no open water to speak of. Not a tundra swan to be found, where we have often seen thousands roosting on the ice at this time of year. The skies were filled with raptors, mostly the rough-legged hawk, a winter visitor to northern Utah. Two bald eagles, uncounted northern harriers, and one fluffed-up short-eared owl. 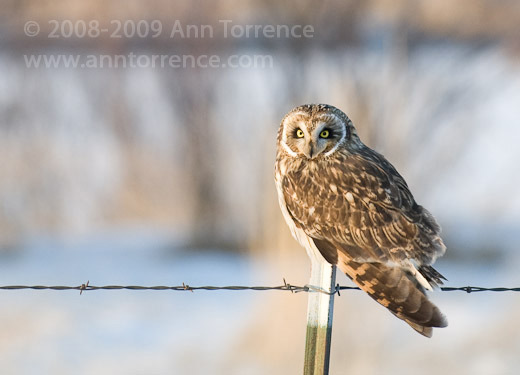 We saw and photographed the same individual on the way in to the refuge and on the return. Photographed with my 70-200 and D700, this image is cropped to about 40% of the original frame height. Once again, I lamented the full-frame of the D700, should have brought out the D2X. Iconoclastic, I know, but I miss my de facto 300mm lens. And even that wasn’t long enough to work with birds. Getting into the game is an investment, but I would surely enjoy it. Even without being able to make the pictures I see out there, it’s great to have a world-class birding environment an hour away from the palace. I’m looking forward to heading back out there as soon as it warms up enough for the first migrating ducks. 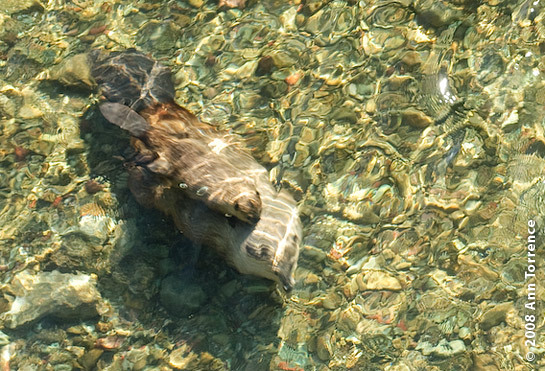 Now here’s something you don’t see too often: a beaver mother swimming with her kit on her back. I was glad I had carried the camera on our walk from the St. Mary’s campground in Glacier National Park to the Visitors’ Center. The smoke from the 2007 fires had been awful, and I wasn’t expecting to get anything. After she swam under the footbridge, she tried to hide baby by kicking up a bunch of mud from the river bottom. What does that have to do with SparkArts? Nothing. Well, maybe the idea that unexpected surprises can go your way if you have the tools and skills at hand. I was asked to give a beginner’s intro to Photoshop. In 60 minutes. Um, yeah. Right. The organizers and I have refined the subject to strategies for learning Photoshop, or just about any other full-service digital imaging software package out there. It’s still too much to cover in 60 minutes, but I’m going to give it a go. So like that little beaver kit, grab on tight, because we’ll be moving fast. SparkArts at the Salt Lake City Main Library, Friday the 21st and Saturday the 22nd of November. Check out the schedule for the Intro to Lightroom talk, scavenger hunt, digital music composition and Dance Dance Revolution contests. This won’t be your usual photography weekend.